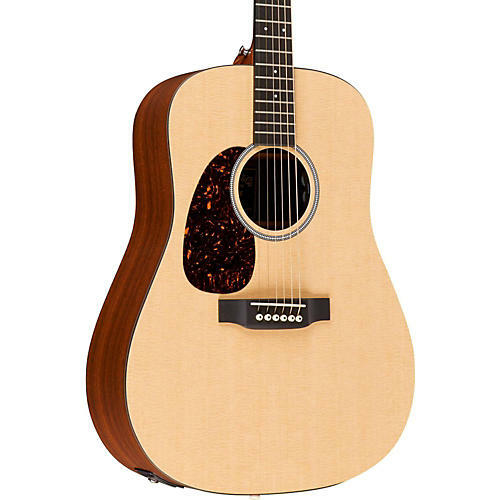 The 6-string Martin DXMAE-L acoustic-electric guitar features Martin’s famous D-14 platform, dreadnought body design. The dreadnought was crafted to produce a powerful, rich sound that is perfect for the singer songwriter, as well as the professional touring and studio musician. The top, back, and sides is constructed using Martin’s famous FSC Certified HPL. For added tone and volume, the top is articulately braced with sitka spruce, in a 5/16 in. scalloped X-bracing pattern. The DXMAE-L has a powerful, rich tone, with all the sustain you have come to expect from a Martin guitar. The mortise-and-tenon neck joint ensures solid construction of the guitar, with optimal resonant tone, while eliminating drop-off in the finer dynamics. The Martin guitar's laminate birch neck is a multilayered wood creation, using bonding layers of wood under extremely high pressure. The material is then carved and finished in a conventional manner. The end result is a very strong neck that provides definition and articulate sustain from note to note. The modified low oval neck shape, 25.4 in. scale, 1-11/16 in. nut width, and 16 in. radius provide comfort and dexterity when performing intricate movements and progressions along the black Richlite fretboard.